One of the many things that Adam and I have in common is that we are both nineties kids. We both remember spending our summers (before we had the Internet, of course) at the public library, reading different comic books and short stories while our parents would be out running errands. I remember one summer in particular when I first began reading R.L. Stine's spooky tales: Goosebumps! Growing up, there were many nights when I would stay up late hiding under the covers with a flashlight and one of the books from the Goosebumps series. 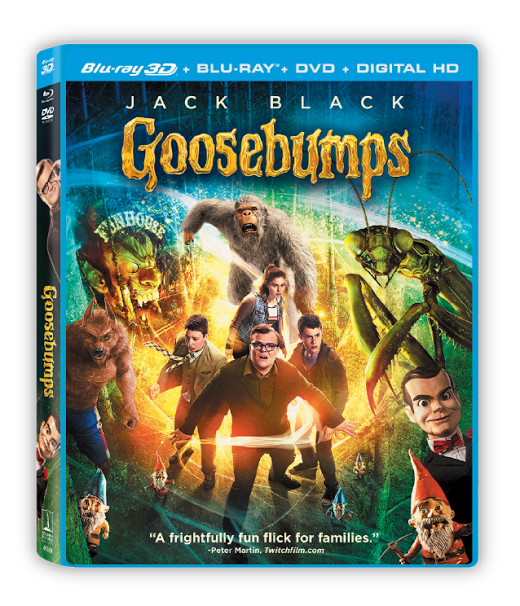 When we first heard that Hollywood creatives at Sony Pictures were working on a Goosebumps movie, we freaked out with excitement! Just thinking about seeing a movie that personified my first encounter with spooky literature gave me so much nostalgia. Once we heard that the movie was released, we made our way down to our local theater to see the movie. Now that the Goosebumps DVD is finally here, we decided to celebrate the release by having a movie night with some Goosebumps-inspired snacks! When I think of the Goosebumps movie, I cannot help but think about all of the different monsters and creators from R.L. Stine's Goosebumps universe. 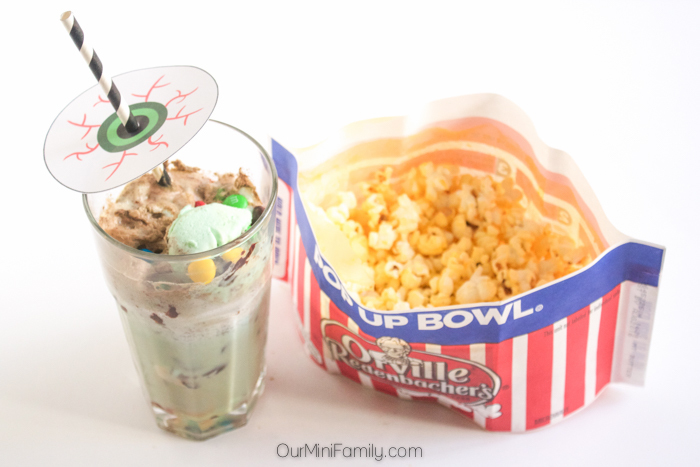 Today, I'm sharing an ice cream float inspired by the Goosebumps books and the movie: "Fearfully Minty" Ice Cream Float! 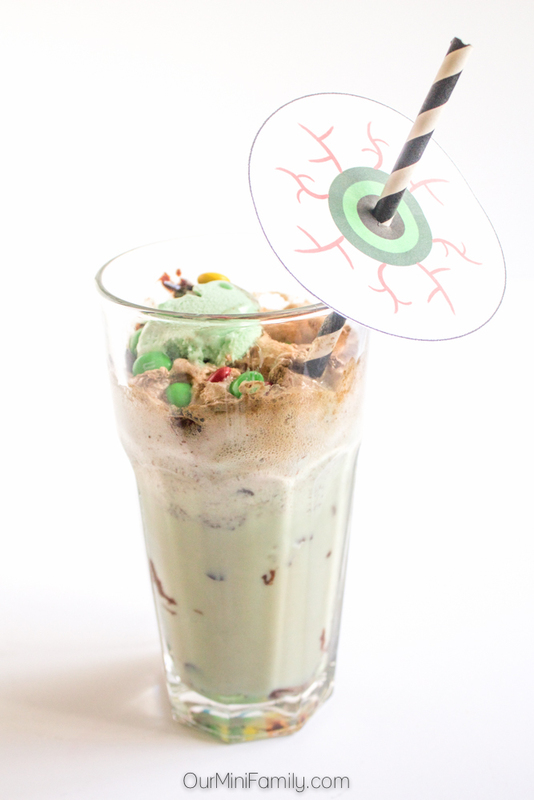 Scoop mint chocolate chip ice cream into a large, tall glass. 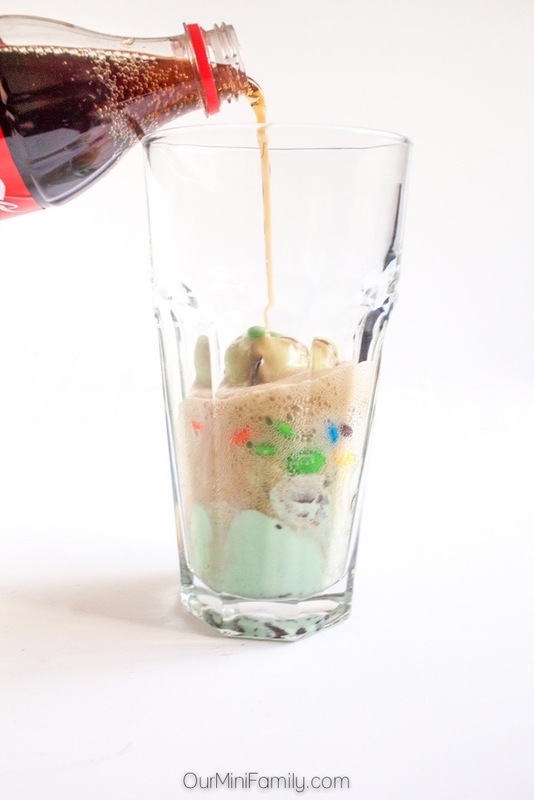 Pour in the M&M'S® Chocolate Candies on top of the ice cream. 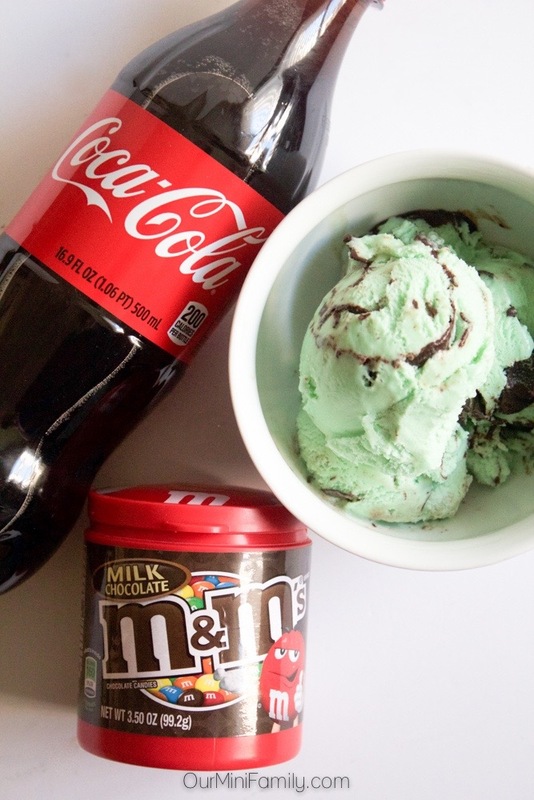 Cover the ice cream and M&M'S® Chocolate Candies in Coca-Cola. Pour the Coca-Cola slowly to prevent the float from overflowing up and over the top of the glass. While Adam snacked on the Orville Redenbacher Movie Theater Popcorn, I indulged in this mint chocolate chip ice cream float. As much as I enjoy making sweets for other people, I don't often stop to enjoy one myself; I just could not pass up this float and a small handful of Milk Chocolate M&M'S® Chocolate Candies. If you have never tried a mint chocolate chip ice cream float with Coca-Cola before, you should definitely add it to your must-try list. Mint is one of those flavors that pairs so well with chocolate and Coca-Cola has been my go-to choice of soda for making ice cream floats. 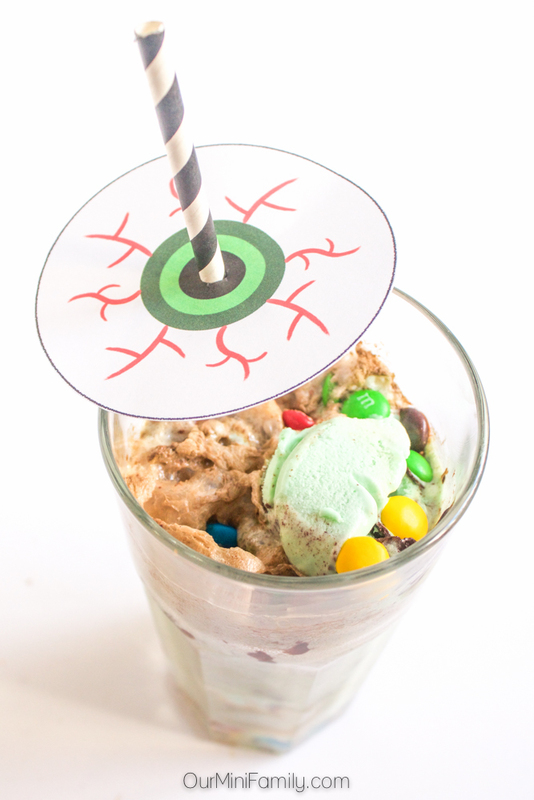 Using this creepy, eyeball straw topper was an easy way to bring some spooky Goosebumps fun to the "Fearfully Minty" Ice Cream Float! Download the eyeball straw topper printable for your next spooky movie night--click here to download the eyeball straw toppers. 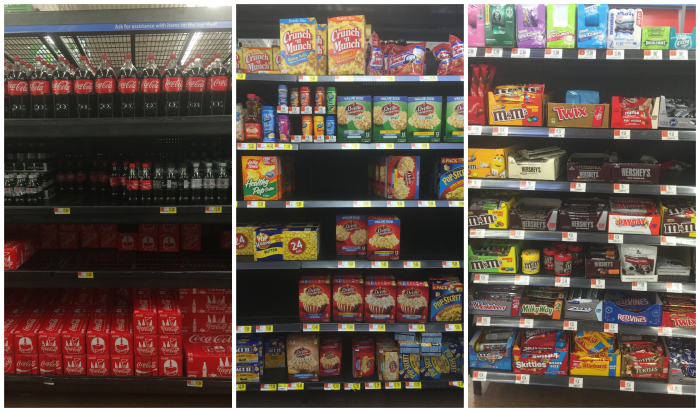 Buy all 4 participating products listed below in one transaction at Walmart between 12/22/15 and 2/2/16 (i.e. Milk Chocolate and Peanut M&M'S® Chocolate Candies, Orville Redenbacher 6 pack Movie Theater Popcorn, Coca-Cola 6-pack, 1/2-liter 16.9 ounce bottles, and the Goosebumps DVD or another participating movie. See the website for details). 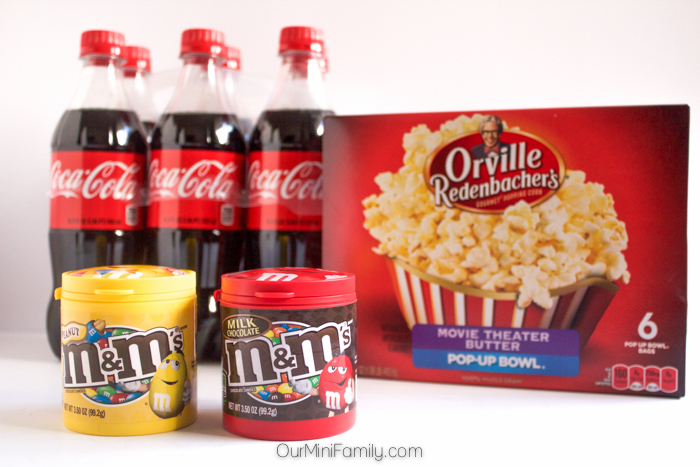 See even more fun movie night ideas on the Make it a Movie Night Social Hub! I never thought to combine coke and mint together! This sounds really good. Coke floats are my favorite, so I want to try this twist. I hope you try it--definitely a fun flavor combo! I wouldn't have thought of this combo. M&Ms in the float sounds interesting. I am going to try it. I love adding M&M'S to my floats! When I saw this it made my mouth water. I love everything in it. I have not made a float in years but will be doing it soon since I read this. Thanks! Oh well if you have not had one in years, it's definitely time to do something about that! Hope you can enjoy one real soon! I love goosebumps and I love your printable! SO cute and this ice cream float looks incredible! I loved goosebumps books growing up! I still have them saved for when our kids get older! This looks so cute and delicious! I can't wait to watch the movie, I was so excited when I heard it was coming out! I love that you saved your books for your kids! I wish Adam and I thought to do something like that! I am sure you will love it, Amber! Ahhh I love this! Just saw the trailer for this movie the other night, and I feel like such a 90s nerd, but I am so excited about it! Looks like fun :) And this drink looks so yummy!! Super Cute!!! This is adorable! I love this idea!